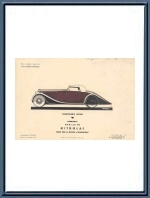 1935 Bugatti Type 57 Bodywork Print - Antem Cabriolet - Chassis 57200. A great vintage item from Carrosserie Jean Antem! This print was issued in 1935 by the paint supplier of Carrosserie Antem, Nitrolac. 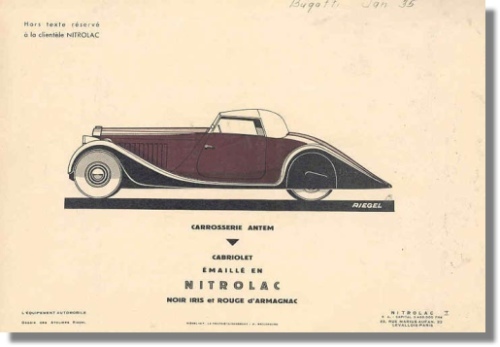 Most probably this was used to demonstrate the proposed color-scheme for their then-recent design as executed on Bugatti T57, chassis number 57200. The proposed colors were called "Noir Iris" and "Rouge d'Armagnac". We only know of 2 contemporary photographs of # 57200 and there it LOOKS to be all black but then again, it is difficult to judge from b&w pictures. An ultra rare item on a one-off car! The print measures some 12 x 8.5 inches or 30 x 20.5 cm.